COLOR(S): Red, black & tan, white with red markings, or white with black & tan markings. COLOR(S): White or any other predominate colors. A replica of the Bull Terrier he shares the same breed standards except for the height. He is strongly built, symmetrical and active, with a keen, determined and intelligent expression. He is full of fire, having a courageous, even temperament. A comical, lively, playful and mischievous dog who may be small, but is not a lap dog. Bull terriers are playful, clownish obedient but also sometimes rough. Bull terriers are energetic and fearless and will become attached and protective of their owners. They accept children but should be supervised. The Bull Terrier has a short thick coat and is an average shedder. Prone to slipped patella (dislocation of the kneecaps), heart defects, kidney failure and skin and flea allergies. Prone to suffer from a zinc deficiency, which can cause death. Gains weight easily. Do not overfeed. White Bull Terriers are prone to deafness. 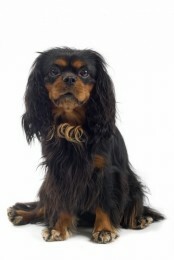 This breed needs vigorous daily exercise, which includes a daily, long walk. The Bull Terrier has a tendency to become overweight and lazy if it is not properly exercised. They need very firm training and lots of exercise. Bull Terriers must be given a lot of structure, or they may become destructive. Be sure to socialize them well and remain their pack leader 100% of the time, otherwise, they can be extremely aggressive with other dogs. Unaltered males may not get along with other male dogs. They are not recommended with other non-canine pets such as rabbits, hamsters and guinea pigs. They make excellent watch dogs. This breed can be somewhat difficult to train.